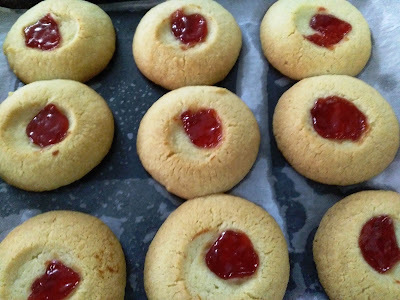 Eggless thumb print jam cookies!! 1.Beat butter & sugar in a bowl with mixer. I used hand beater. 2. Mix till mixture becomes fluffy. 3. Add Vanilla essence & mix well. 4. Add flour & desi ghee. Make a nice dough. 5. Keep the dough in Fridge or 1/2 an hour. 6. Keep tray ready with butter paper. Greasing is not required. 7. Prepare the balls with hollow in the centre. 8. Fill with jam. Bake the cookies at 180 C for 10 to 12 minutes. 9. Cool for 2 minutes. Transfer on wire rack & cool completely.